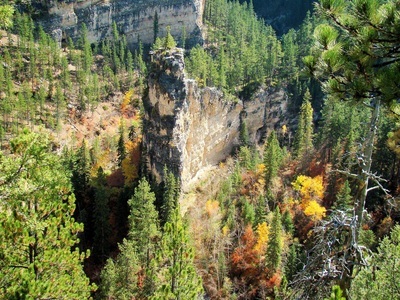 This view of Elk Creek Canyon is from the north rim. Knifeblade Rock is in the lower right corner of the photo. 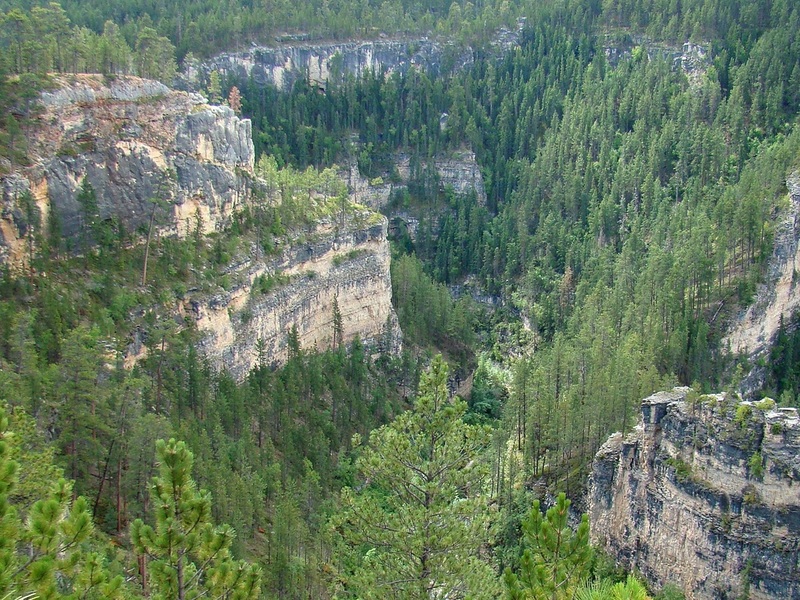 One of the most beautiful canyons in the Black Hills is located in Meade County, near Tilford. 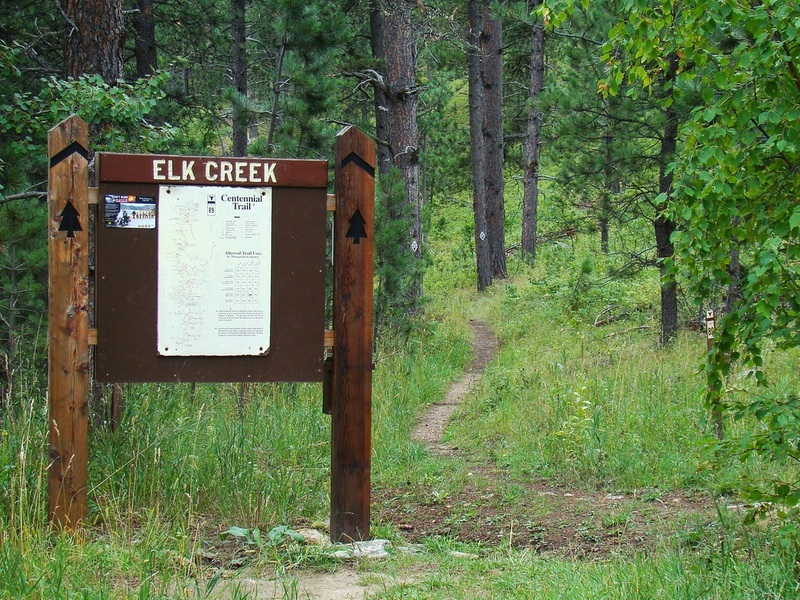 Elk Creek Canyon is characterized by steep, high limestone walls and rugged outcroppings, while the canyon floor is covered with lush vegetation. 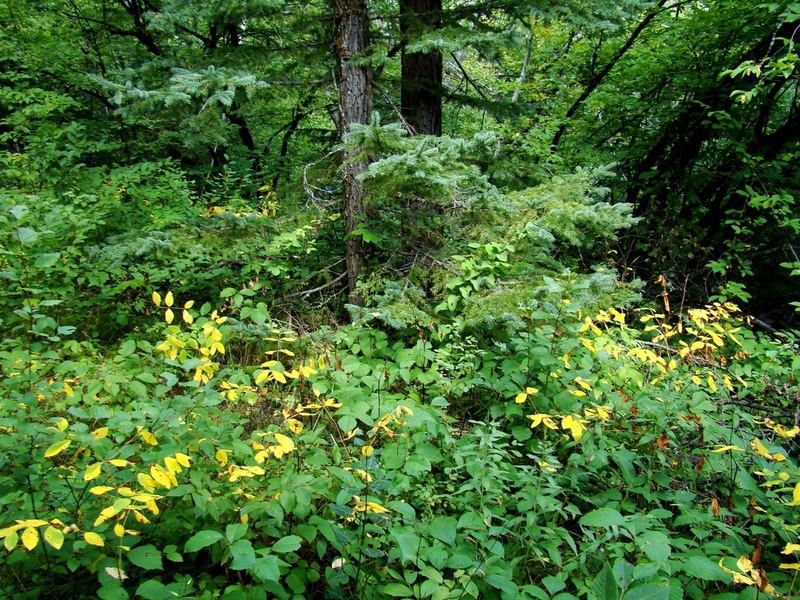 Common trees in the canyon include ash, oak, willow, box elder, spruce, pine, birch and aspen. 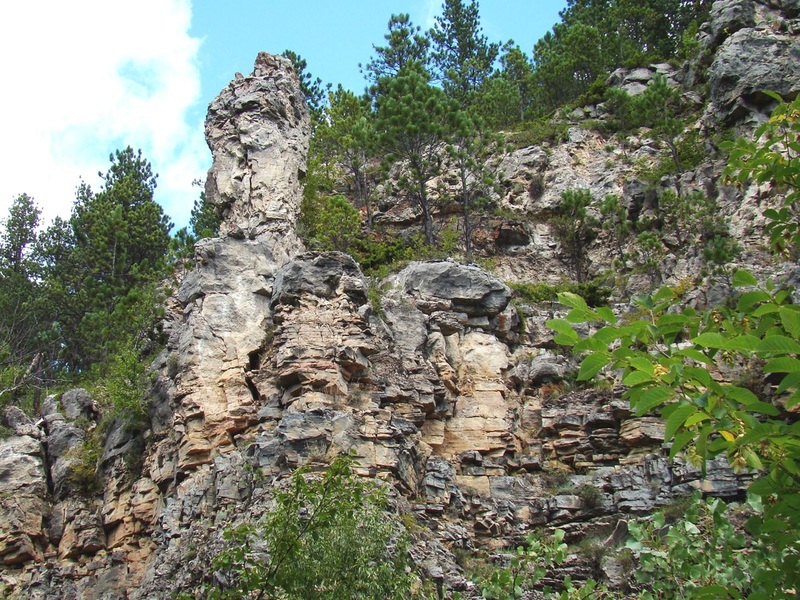 Three notable rock formations are found in the canyon, including Knife Blade Rock, Signal Rock and Giant Bluff. 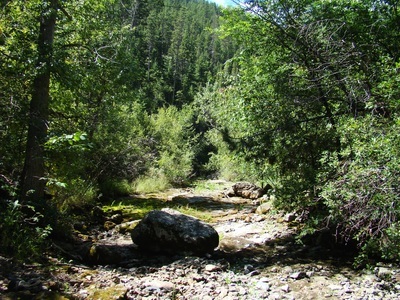 Stream flow is not consistent year-around in Elk Creek Canyon. 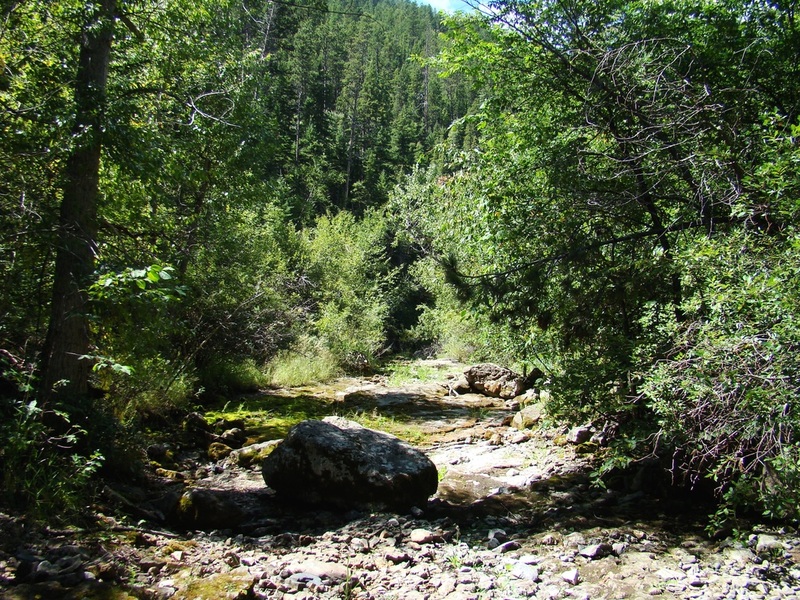 Springs are located in various places in the lower canyon, sometimes with stream flow that usually returns underground further downstream, except when there is high runoff after storms or snowmelt. 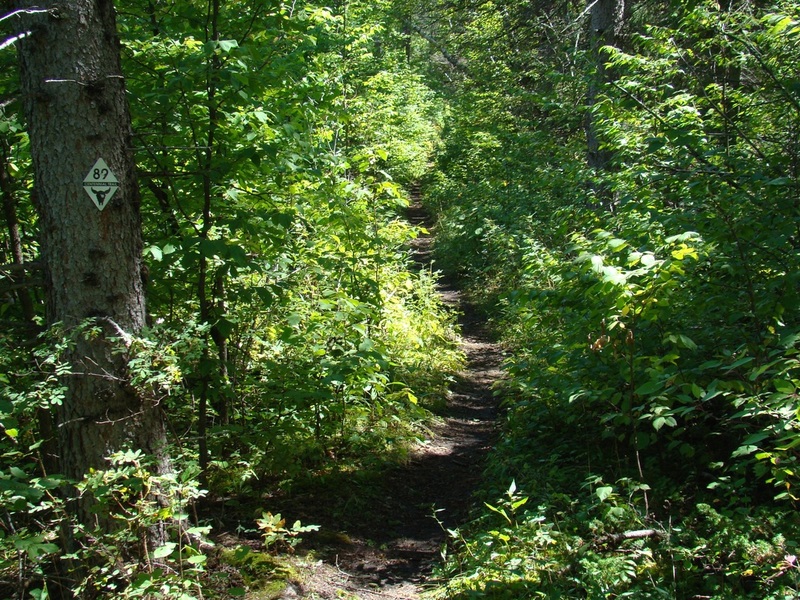 Those melting snows and spring rains often wash out portions of the trail and can temporarily create hazardous situations for hiking and mountain biking. 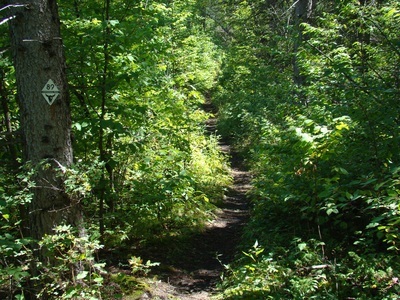 There are five stream crossings on the Centennial Trail – some with rope lines for security. 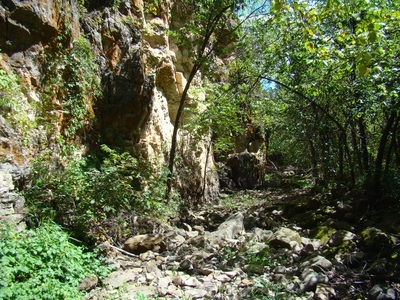 Because of the steep sides of the canyon, the lush and thick vegetation on the canyon floor and a very rocky and rough stream bed, off-trail hiking is difficult at best. 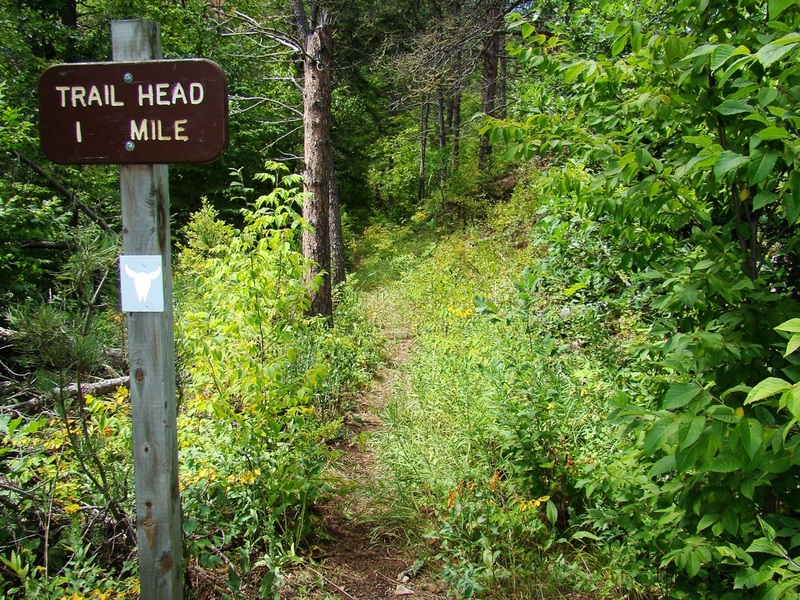 The only good access into the canyon is by way of the Centennial Trail, which has about 1.5 miles on the canyon floor – in some places on the old narrow gauge railroad bed. There are some great overlooks in the middle canyon area, by way of old forest service roads, especially in the areas around Wonderland Cave and Bethlehem Cave. 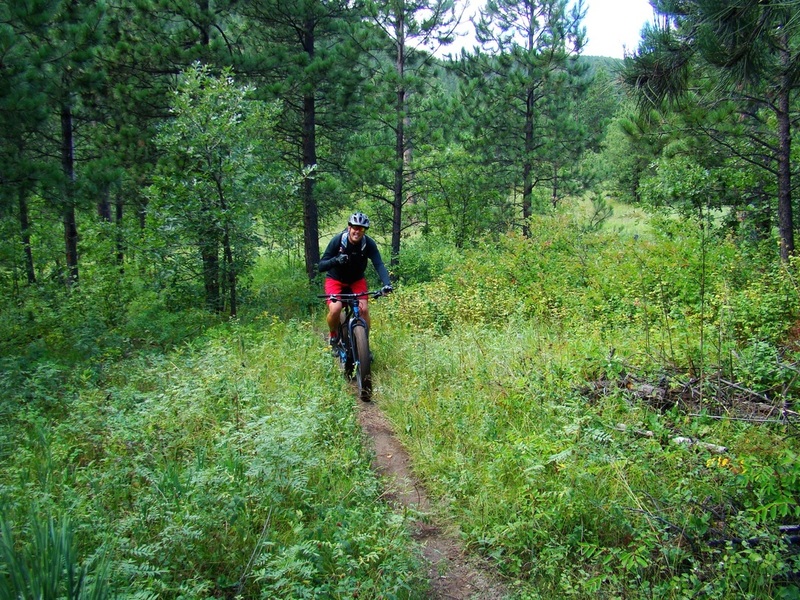 The only good way down to the canyon floor is by way of the Centennial Trail. The Elk Creek Trailhead can be accessed from Sturgis by traveling 8 miles south on Vanocker Canyon Road, then east 3 miles on Runkle Road. 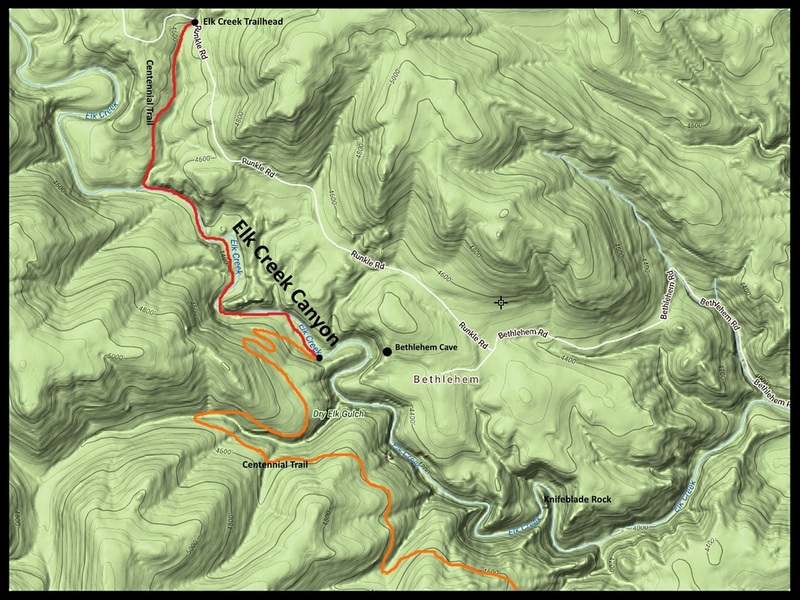 Construction on a narrow gauge rail line was begun in Elk Creek Canyon in 1881 by the Homestake Gold Mine in Lead. The line reached Piedmont in 1890. The line was initially a mining supply line, but eventually passenger and freight services were added. The rail line was destroyed by a massive flood in 1907, caused by heavy rain and runoff from snowmelt. Nine miles of track were washed out, leaving little trace of the former line in many places. That flood and subsequent floods have almost returned the canyon to its pre-railroad condition. The old ghost town of Runkle was located on the north rim of the canyon, just a few miles west of Crystal Cave. 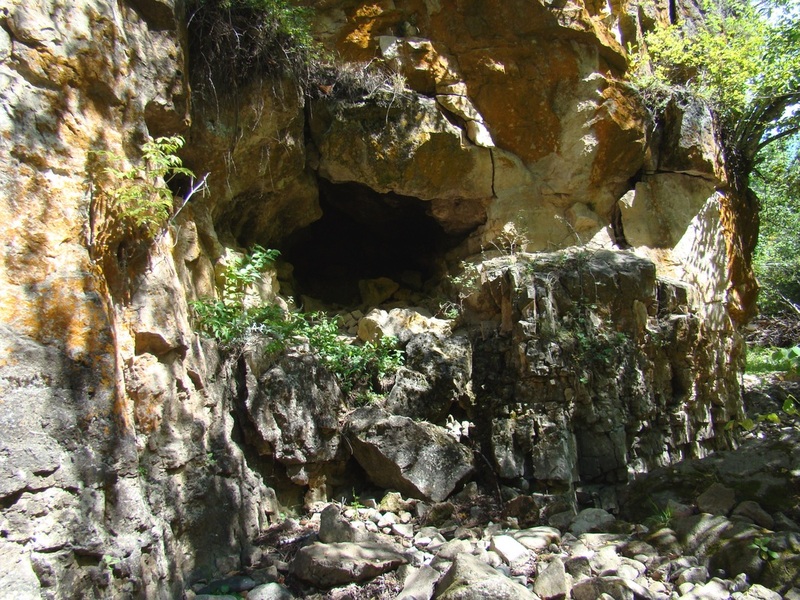 Crystal Cave was discovered in 1876 along the north rim of the canyon, and tours began about 1890. 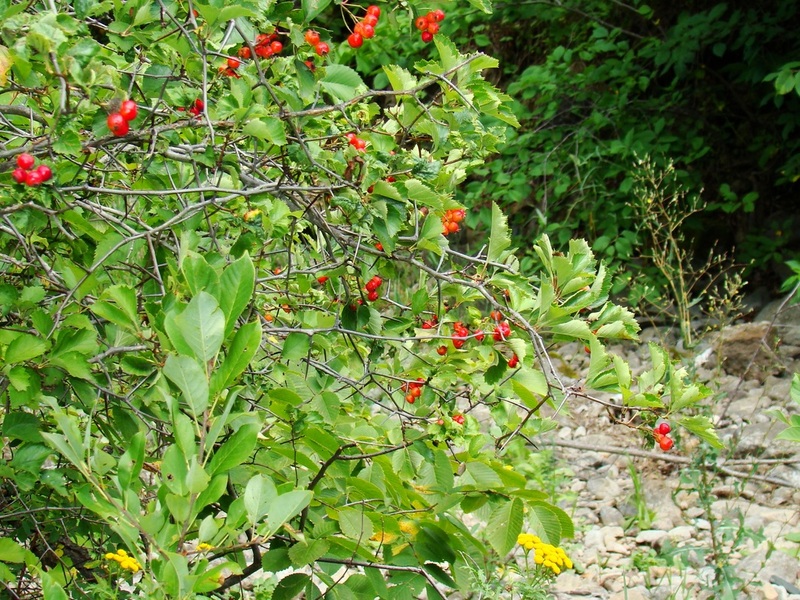 Crystal Cave was re-named to Bethlehem Cave in 1957 when ownership was transferred to the Catholic Church. The cave became a monastery and home of Benedictine Monks. The Shrine of the Nativity was constructed in the cave entrance. For whatever reason, the cave was closed in 2004. Wonderland Cave is near the south rim of Elk Creek Canyon and is almost straight south of Bethlehem Cave. Wonderland Cave is still open to the public and is a popular tourist attraction. Wildflowers and berries grow on the canyon floor. This rough stretch of trail is near the lower end of the trail in the canyon. A friendly mountain biker on the trail.